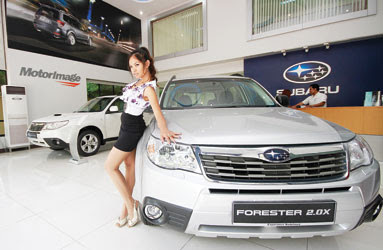 SUBARU is a relatively new brand on the Cambodian market, but the Forester 2010 four-door 2.5-litre SUV has won four safety awards despite its simple interior design and symmetrical all-wheel drive. Imported by Motor Image Group, the latest model has a lower-slung Boxer Engine and AWD that helps balance a low center of gravity with generous ground clearance. The expert, who has more than 15 years experience in vehicle servicing, pointed out the Forester’s other unique safety functions. In case of a front crash, the lower engine is designed to slip backward without hitting the steering wheel or harming the driver. Besides, with eight airbags, the strong metal cage built inside the two rear doors can prevent injuries from crashes on all sides. “Subaru’s focus is on everything to improve safety,” said Vicheth Mao. However, the Forester is also designed to appeal to amateur racers. While the media kit says the car can reach 100 kilometres an hour in just seven seconds, Mao confirmed that he had reached that speed within just three seconds while demonstrating the model – rendering his clients speechless. According to him, Subaru has also earned motoring awards for the best car in rough driving conditions, and wanted to reassure his client by driving to a bumpy sandy area at a construction area in Koh Pich. Even with the music player and air-conditioner turned off, the Forester silently moved forward with ease, making the driver and passenger feel as comfortable as if they were driving on a smooth highway. Priced between US$50,000 and US$60,000, the new Forester 2010 uses between 8 and 12 litres of fuel for each 100 kilometres. And the service interval is 4,000 kilometres between visits to the garage. Entertainment features include high-definition audio, a seven-speaker premium sound system, iPod jack, Bluetooth, hands-free calling, enhanced rear vision for easier parking and ambient lighting for better night driving.